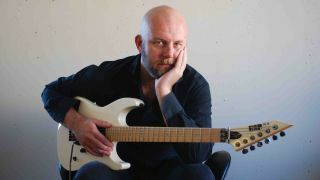 Outside of his crushing playing with Swedish heavy metal stalwarts Soilwork, David Andersson deals a mean hand in soaring classic-rock melodies and harmonised guitar solos with The Night Flight Orchestra. True to form, the classic-rockers' recently released third album, Amber Galactic, provides another showcase for Andersson's judicious balance of melody and technique, no matter the genre. “I have a red American Fender Stratocaster that I bought in '97, but it was made in '96. We had a break-in at our rehearsal space, and all my guitars were stolen. I had a gig the same week, so I had to get a new guitar. I was a young slacker without a steady job and very limited funds. I went to the local music store and tried all the guitars that I could afford, and this one really stood out. So I took all the money I had, around €700, and bought it, then I had to wait to get paid for the gig before I could buy food again, but it was worth it. “I usually hate pedals when playing live - I don’t even switch channels on the amp. I just go straight in via a tuner, and when I need a clean sound, I just turn down the volume knob on the guitar. It takes away so much from the overall feeling if you have to tap-dance on a bunch of pedals, and besides that, no-one really hears the small details live anyway. “But the one pedal I actually enjoy using live, and especially in the studio, is my Way Huge ring modulator. I’ve always loved the sound of ring modulators ever since I first heard Miles Out on Mahavishnu Orchestra’s Inner Worlds album as a teenager. It’s just so totally disharmonic and out there, in the most beautiful way. So when we got an endorsement deal with Dunlop a few years back, it was the only pedal I wanted. It’s all over the last two Night Flight Orchestra albums on almost every song, even if most people probably think it’s a synthesizer. It’s on the latest Soilwork album as well. “I guess I regret most of them in a way, but at the same time I’ve never been much of a gearhead. At the end of the day, it really doesn’t make that much of a difference what kind of guitar or amp you’re using, even if most guitarists probably hate me for saying so. But if you’re a good musician, and have a good enough pair of ears to realise the limitations of whatever gear you happen to play on and through, you can make everything sound good. 5. When did you last practise and what did you play? “Both yes and no. You always want to progress and create better and better music, but on a purely technical guitar level, I’m quite comfortable with where I am. “I got serious about guitar playing at the end of the first shredding era during the first half of the '90s, and when I was younger, I always felt the need to prove myself and try to throw in as much difficult stuff as I could manage, and I was constantly frustrated about all the things that I wasn’t able to do. “But at some point as I grew older, I realised that all my favourite guitarists, like Tommy Bolin, Steve Hackett, Neil Young and Francis Dunnery, all had their limitations, and that was part of what made them interesting. These days, there are quite a few super-shredders around that can play pretty much everything, and although it’s really impressive, I never feel any need whatsoever to listen to any of them. “I haven’t had any lessons since I was a teenager, so the whole idea of taking lessons seems very foreign to me. These days, there's so much information out there, so you can pretty much figure out most things on your own through the internet. I’m also a bit afraid of meeting my heroes, in case they’re horrible people and you end up not wanting to listen to them any more. “That would be the red Fender Strat again. At home, I’ve always played my electric guitars unamplified, and I’ve come to love that sound. Most guitarists love to have their guitar really loud on stage, but I hate it if my own guitar’s too loud. I like it to blend in nicely with the rest. And that’s probably because I never play with an amplifier at home. “We played the Loud Park festival in Japan with Soilwork a few years ago. It’s Japan’s biggest metal festival. The Japanese stage techs were very organised and efficient, as always. I didn’t bring a wireless, just a really long cord. The stage techs marked the spot on stage right where I’d be standing for most of the show, and I didn’t think any more about it. The Night Flight Orchestra's new album, Amber Galactic, is out now.